THIS YEAR'S RACE IS OVER, BUT WE'RE EXCITED TO REPORT THAT WE RAISED OVER $14,000 FOR NEIGHBOR HELPING NEIGHBOR!!!! The race starts on the pavement of the Main Road in Huntington and then travels on Camel's Hump Road... a dirt road that passes verdant fields and the rolling river as it gently slopes up towards one of the state's most iconic mountains. Choose to race the 5K with slight incline or the 10K with same incline but more pavement running. OR choose the 1mile fun run. 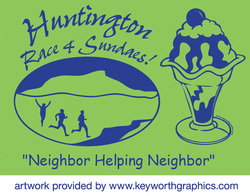 All races end near the Huntington Recreation Field where all registered runners will receive a free sundae! Runners pre-registered by 6/18 will be guaranteed a t-shirt. All others will be first come, first served on race day. Prizes will be awarded to top finishers also!